The lack of expan­sion in the Aus­tralian pri­vate credit mar­kets is cer­tainly hav­ing an adverse effect on com­merce in the post 2008 finan­cial cri­sis period. Annual pri­vate credit growth has aver­aged 3.5%, since it dropped down to sin­gle digit fig­ures in Octo­ber 2008. Per­sonal credit and busi­ness credit have been the deadweight’s, aver­ag­ing an annual growth of –1% and –0.5% respec­tively. Hous­ing credit has off­set this with an aver­age annual growth rate of 6.9% since Octo­ber 2008. How­ever, this has since slowed to an aver­age annual rate of 5.3% for the first 3 months of this year and is con­tin­u­ing on this slow­ing trend. With sig­nif­i­cantly less credit com­ing into the mar­ket, the Gov­ern­ment have had no choice but to com­pen­sate deficit spend­ing. Though, as pointed out in last week’s blog post Infla­tion or Nofla­tion, the ALP has recently embarked on a mis­sion of aus­ter­ity to please the big rat­ing agen­cies. This leaves increas­ingly fewer options to main­tain a path of eco­nomic growth here in Aus­tralia. The dete­ri­o­ra­tion in credit growth has forced the RBA to revise their already revised eco­nomic out­looks. 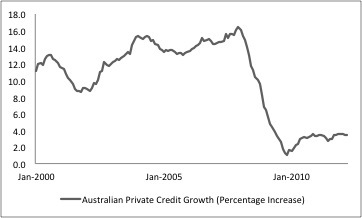 The fol­low­ing graphs review the RBA’s pred­i­ca­tions ver­sus the actual out­comes for both growth and infla­tion. While the accu­racy of these out­looks is debat­able, the pre­ci­sion of their recent 2012 pre­dic­tion for infla­tion has posi­tioned the Bank well in jus­ti­fy­ing a 50 basis point reduc­tion of the tar­get cash rate on Tues­day 1 May. How­ever, given the two 25 basis point reduc­tions for Novem­ber and Decem­ber last year had no notice­able effect on credit growth, par­tic­u­larly hous­ing credit growth, I would sug­gest this mea­sure will too pro­vide lit­tle effec­tive­ness. And then, of course, there is always the ques­tion of how much the big banks will actu­ally pass on with their increas­ing fund­ing costs. NAB have so far been the first, pass­ing on 32bps. With min­ing con­di­tions dete­ri­o­rat­ing, house prices falling, Gov­ern­ment aus­ter­ity mea­sures, a strug­gling retail sec­tor and lack of effec­tive­ness through mon­e­tary stim­u­lus, unfor­tu­nately the Aus­tralian econ­omy has nowhere to grow. A Flow or Net Flow of Hous­ing Stock? Net­FIRE = P*Q*T , All of Asset price, and quan­tity and T.
Could P*Q*T = P*dQ/dT= PQ’ ? T was given as the pro­por­tion of Q that trades in a time period. The clue was Steve might have said (net) rate of trans­ac­tions, and T seemed to be a fre­quency i.e. units of 1/[time]. And put together there was only a por­tion of Q trans­acted, thus dQ/dt. Thus we have the instan­ta­neous rate or flow. Here is an other way. Would that sim­plify or clar­ify any thing? One could always switch to the Delta nota­tion. Pro­fes­sor Keen; if this helps, how about a free $2 data mem­ber­ship? I’ve tried that and got much lower cor­re­la­tion coef­fi­cients. The point is that one side of the equa­tion gives sources of money, and the other how the money is spent. There­fore it appears that the actual lev­els of prices and quan­ti­ties make more sense, rather than their rates of change, in the RHS. RJ, MMT con­tains a log­i­cal error when applied to a mixed fiat-credit money econ­omy. It is there­fore not an expla­na­tion of the actual work­ings of the sys­tem we work in. I have been hold­ing off on mak­ing this state­ment until I had com­pleted the paper, but I get tired of you for­ever stat­ing as fact some­thing that I know con­tains an error–not a fatal one, but one that reduces the effec­tive­ness of its reme­dies. I realise you’re tired of wait­ing for my full paper too; tough. My work­load con­trols me to a large degree, and I now have another paper for which I have an absolute dead­line of Mon­day week. Once that one’s sub­mit­ted, I’ll return the the MMT cri­tique. –our money. This is money that can be used in the real econ­omy. This = bank credit. Notes and coins is just a token to rep­re­sent bank credit. Both are backed by debt. - The banks and mon­e­tary sov­er­eign Govts money = cen­tral bank reserves. But if your paper is clear on the rel­e­vant points (not hid­den in con­fus­ing mod­els) then an inter­est debate on what­ever issues you raise can take place. Your mod­els use con­tin­u­ous time form. It might be use­ful in your mod­el­ing, being in the form of a spe­cific (net) flow, dQ/dt. It might be more explicit, clearer, or cleaner than Q*T and the ver­bal descrip­tion of T.
Your empir­i­cal graphs of course are made using dis­creet time finite dif­fer­ences. I men­tioned that the delta form of Q’ could be used (just like your empir­i­cal graphs), but should have spelled out in for­mula because its eas­ier to see that way. The com­ments in word­press might won’t ren­der the greek Delta sym­bol. When one has dQ/dt one can always use DeltaQ/DeltaT or Change in Q/(Change in t) or visa versa. The point I hoped to make was that these forms are more math­e­mat­i­cally com­plete than using Q*T, with a ver­bal descrip­tion of what T is. This way the mean­ing of time, t, is specif­i­cally in the for­mula. If time, t, is on the bot­tom it seems more clear. Thus it maybe eas­ier to under­stand, eas­ier for oth­ers to see quickly, remem­ber, and stick in your stock flow mod­els as a flow of Q being Q’. Q’ can be stuck into your numer­i­cal solv­ing soft­ware. Note: If one would model both Q and P I think the DEB would look a lot like book­keep­ing for phys­i­cal stocks or inven­tory where both P and Q are recorded. I have not posted to this site for some time, but I remem­ber post­ing back in 2008–9 that house prices would not fall not because Prof Keen was wrong but because the debt band­wagon could be kicked off again in Aus­tralia. Prof Keen has cer­tainly changed my think­ing. I wrote what appears below to sev­eral beach town local news­pa­pers and com­mu­nity pub­li­ca­tions in West­ern Aus­tralia. Real estate is big busi­ness in such towns and local real estate agents still heav­ily spruik the ben­e­fits and wis­dom of bor­row­ing to invest in hous­ing. Now maybe my arti­cle is far too long and not so well writ­ten, but not one of them printed, acknowl­edged or sum­marised it. Peo­ple (house­hold­ers, banks, gov­ern­ments etc) do not want do not want to know about falling house prices! My thoughts on try­ing to explain why Prof Keen is right to peo­ple who do not fol­low eco­nom­ics. For many Aus­tralians, hous­ing, the price of hous­ing, rental invest­ing and owing a home is a sub­ject of con­sid­er­able impor­tance. Buy­ing a house, be it a home or a rental, is a major finan­cial deci­sion. What is often lack­ing in the hous­ing debate, how­ever, is a bit of eco­nomic analy­sis, let’s face it Aus­tralia has some of the most expen­sive hous­ing in the world so should you buy a house? “Pay­ing rent is a waste of money many,” many peo­ple declare with­out acknowl­edg­ing that when you bor­row money to buy a house you are still pay­ing rent, but this time it is on a bank loan (it’s called inter­est), which let’s face it is more than you will be pay­ing the land­lord any­way. If you are pay­ing $500 a week in rent you are prob­a­bly liv­ing in a $500,000 house. Bor­row $500,000 and you will likely be pay­ing $700 a week just in inter­est. More­over, you no longer have a land­lord who picks up the repair, rates, insur­ance and other bills — add another $100 a week for these. “Oh well,” you say, “I don’t care because my house will go up in value, hous­ing always goes up!” OK but it can­not hurt to think about how much hous­ing has to go up each year to com­pen­sate for the fact that you are pay­ing $800 a week to live in a $500,000 house as opposed to $500 for rent­ing one. $300 a week extra that’s $15,600 a year. Finally, remem­ber when you sell a house you will likely end up pay­ing around 3% in agents com­mis­sions. More­over, when you bought the house you prob­a­bly also paid about 4% in stamp duty. A 4% increase in the price of your house each year, how­ever, does not mean you have made a profit, all you have done is avoid a loss. Lets say you expect to make a small profit, say $50,000 over 5 years. Mak­ing a $50,000 profit over 5 years on a $500,000 invest­ment is a pretty poor rate of return but I am try­ing to be con­ser­v­a­tive here. Nev­er­the­less, even with the small $50,000 profit you now need to sell the house for $666,000. Over 5 years that means a price growth of 6% a year. Now here is the prob­lem — as men­tioned Aus­tralia has some of the most expen­sive hous­ing in the world. More­over, when the aver­age Aus­tralian buys a house they rarely if ever pay cash, they bor­row! The typ­i­cal Aus­tralian home buyer is already maxed out when it comes to bor­row­ing for hous­ing so it pays to think about who is bor­row­ing the $666,000 to buy the house you paid $500,000 for. The answer, some­one like you, dif­fer­ence is unlike you they have to bor­row $666,000 not the $500,000 you got away with. “Oh well, you say such is life,” but here is the warn­ing, the per­son who bor­rows the $666,000 will need to ser­vice a $666,000 loan. When you bor­rowed your $500,000, lets assume you took out a 40 year loan. On such a loan you are prob­a­bly pay­ing about $3,300 a month in repay­ments. The $666,000 bor­rower, how­ever, has to pay $4,400 a month, that’s 33% more a month than you, where did they get this extra money from? Well wages have gone up haven’t they! Now this is where things get a lit­tle bit com­pli­cated so bear with me a moment. Take the posi­tion that you, the per­son who bor­rowed and bought the house for $500,000, was on a $80,000 wage at the time. 5 years later the $666,000 bor­rower will need an extra $13,200 a year (1,100 x 12) to ser­vice their loan. Also, do not for­get that when you earn wages you pay tax. If you assume your mar­ginal tax rate is 41.5% then to earn an extra $13,200 a year after tax you need to earn $22,564 before tax ($22,564 less 41.5% tax gives you $18,200). This means wages need to go up from $80,000 to $102,564 over 5 years — that is a 5% increase a year. This is a crit­i­cal prob­lem because if aver­age wages are going up 5% a year you have what is called ‘wage price infla­tion’ and guess what hap­pens when you get wage price infla­tion? The Reserve Bank hikes inter­est rates! This means our poor old $666,000 bor­rower will not be pay­ing 7 or 8% inter­est like you but likely 9 or 10%. That means even more wages must be earned because a 40 year loan at 10% inter­est demands a loan repay­ment of around $5,655 a month — where is all this money com­ing from? Here is the warn­ing about Aus­tralian houses. Houses are bought with debt; house­hold debt in Aus­tralia is huge. Australian’s owe about one tril­lion dol­lars, that’s right a thou­sand bil­lion dol­lars on their houses. More­over, most of this debt has been piled on over the last twenty years. The hous­ing boom in Aus­tralia was a boom dri­ven by peo­ple tak­ing on ever more hous­ing debt. The boom days have ended because the aver­age Aus­tralian can­not ser­vice the ever big­ger mort­gage you need if you want to buy hous­ing that keeps going up in price. This is the main rea­son why, even though there is a hous­ing short­age in Perth prices are falling; not going up. There is no rea­son why you should not buy a house but if you do so with the view to sell­ing it at a profit I sug­gest you spend some­time tak­ing a seri­ous look at the rela­tion­ship between debt and house prices. There is plenty of free infor­ma­tion on this sub­ject online (start with Steve Keen’s debt blog). Finally, if some­one says “but this is a great loca­tion, it is dif­fer­ent it will go up,” I would say, “maybe, know one knows for sure.” The world is fac­ing a pos­si­ble global warm­ing energy crises that may see ura­nium take off as a major source of car­bon replace­ment for the gen­er­a­tion of base power. The recent run of mishaps impact­ing the ura­nium indus­try is mak­ing ura­nium shares very cheap, buy ura­nium shares now and you could make a for­tune, but then again, just like the future price of a house, no one knows for sure, do they?